Welcome to my pin trading page. My name is Mark and I live in the Atlanta area. Olympic pins are my main interest, but I also collect Disney pins, Hot Air Balloon pins, Hard Rock Cafe pins, and others. I am mostly interested in trading, so if you see something of interest, let me know. I also have sports memorabilia and Coca-Cola collectibles available for trade. I am mostly interested in pins, but I will mix and match to make a trade. I will keep this site current, so please come by often. If you are interested in purchasing pins, just let me know. Most pins on the site are $5 each. 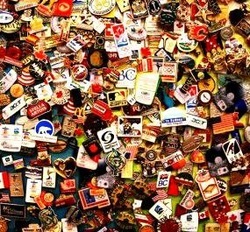 Bid pins, Hard Rock Café pins, and newer Olympic pins may be possibly more - just email for prices.